Some days you simply can't bring yourself to crank out set after set of the same exercise. You just want to tackle those burpees, box jumps or power cleans and be done with them. That way, you don't have to think about them for the rest of your workout. Chipper workouts give you just that. They combine a variety of exercises at high repetition, "chipping" away at the given number of reps one by one until they're finished. While these workouts can be grueling, they can also trick your mind into pushing well past your normal boundaries. "You've heard the old saying, 'How do you eat an elephant? One bite at a time.' Well it certainly rings true with Chippers," Adam Smith, a personal trainer at elite sports training facility Thanyapura, says. "Like any aspect in life, if you are able to break down the big goal into smaller, bite-size goals, it helps make it achievable," he says. "What the mind can conceive, the body will follow." While some workouts feel like the sets and reps will never end, Chipper workouts immediately show you a light at the end of the workout tunnel. There are a set number of reps that decrease as each rep is completed, giving you the ability to count down your reps with each movement. "When the mind is set that there's a tough workout ahead, the workout is much more difficult," says personal trainer Gabe Hihira. "With a Chipper, you know that you have one set (per movement), which can massively alter the mindset of someone who is accustomed to repeating multiple rounds or sets." 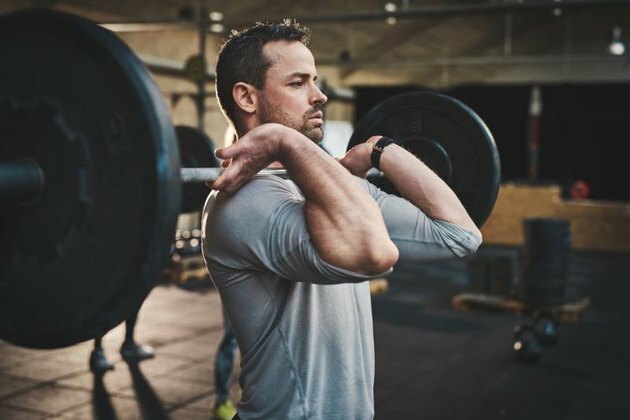 According to neuropsychologist Kate Cummins, Ph.D., who specializes in sports psychology, these types of longer workouts don't require you to focus as rigorously on task completion. "Because of this, highly motivated individuals are more likely to be drawn toward Chipper workouts." Not only do you get to cross an exercise off you're list once you're done with the prescribed reps, but counting down those reps also helps trick your brain into allowing your body to work harder. "Counting down adds a feeling of completion as you see the target number getting smaller, which can boost the morale of an athlete and result in greater effort," says personal trainer Hihira. And personal trainer Adam Smith points out that seeing those 50 reps of a specific movement signals to your brain, "This is all I've got to get through, and then I'm done." Smith and Dr. Cummins both compare this to a mental image of a finish line. Chipper workouts are a great overall strength training and metabolic conditioning workout. "Since the Chipper eliminates rest and increases muscle endurance beyond the body's standard threshold, this creates massive shock to the body and leads to change," says Hihira. Smith also adds that, compared with an AMRAP (as many rounds as possible) workout, Chipper workouts let you enter with a more positive mindset. With AMRAP you don't know how many rounds you'll be able to complete. "If you don't have the right state of mind, drive or competitiveness, you'll never get as much out of yourself." And isn't that exactly what you want out of your workouts? Ready to give Chipper workouts a shot? Here are three workouts you can incorporate into your routine. Have you ever tried a Chipper workout? What did you think? If you'd never heard of them before, do you think you'd try one? What do you think of these sample workouts? Will you incorporate any of them into your fitness routine? What other exercise tricks do you use to get yourself through a workout? Share your thoughts, suggestions and questions in the comments below!